UWC scholarships for Nepalese students have increasing been partial, even the “full scholarships” do not include travel and personal expenses. Whereas in the past students were selected purely on the basis of merit, now it’s based on ‘potential,’ as per the new UWC guidelines. The advantage is that we are able to recruit UWC scholars from a wider pool of applicants, representing a larger range of socio-economic backgrounds and geographic locations, even those from very low socio-economic backgrounds that have graduated from resource-strapped, struggling government schools! The challenge, as I have hinted elsewhere, is that of providing the necessary financial support. The Committee is endeavoring to raise funds both within and outside the country. If we don’t raise enough funds, then the scholarship could well end up being offered to children from wealthy families, children who would be able to further their education regardless of a scholarship, which I don’t want to see happen! While last year we had just one, this year we have five full scholarships and so five students needing financial help. (Since posting “2015 UWC Scholarships and Challenges,” we have had more offers!) Of course, these five do NOT include the one from Samaanta Foundation Nepal going to UWC Mostar and the one from SMD College for Himalayan Children Nepal going to Red Cross Nordic UWC. As it stands now, we estimate that each student will need a minimum of US$2500 for their entire UWC career to cover travel–a single return ticket–and personal expenses. The amount we are aiming to raise therefore is at least US$12,500 (approximately Rs. 1,237,500). Funds raised through this page will be allocated to the scholars with input from others involved in the process, instead of being based on some hard and fast rule. Where do you come in? You can help by donating! Donate through Paypal by sending funds to my email address: dorje[underscore]dhindul[at]yahoo[dot]com OR dorje[dot]gurung[at]gmail[dot]com. 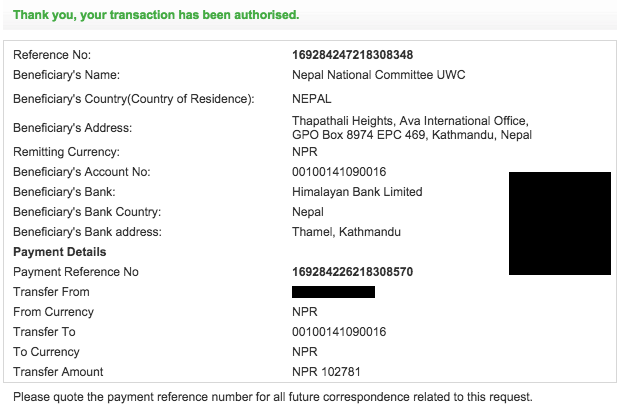 If you are in Nepal, you can donate directly to the National Committee by going to our online donation page here. Regardless, once you donate, please let me know using the Contact Form which appears farther down the side bar. In the message, please also let me know if you would like your name to appear in the donor roll below or if you would rather remain anonymous. NB: The first two entries are funds raised through the first post about this year’s selection. The fundraising drive has come to an end. Details of how the funds were disbursed will be posted as soon as they are finalized after consultation with other volunteers involved in the process. Travelling in the US when everything associated with sending the UWC scholars were being finalized, I didn’t take part in any of it. What I was able to do was transfer the funds into the National Committee bank account. Here are the details.